Apatin is located in the autonomous province of Vojvodina. Many migrants came to the city, due to its location on the Danube shore and its port. Apatin was the site of the largest German community in Bačka. Apatin was first mentioned in 1093 as an abbey in the diocese of Kalocsa. The abbey belonged to Hungary at that time. In the mid-16th century, Apatin was conquered by the Ottomans. In 1687, the abbey was given to the Habsburgs. The depopulated landscape was resettled with Habsburg migrants from German territories and Apatin became the final destination of the ships coming from Ulm. A food and grain storage facility and several mills were built and guarded by German soldiers. In the mid-18th century, a large-scale settlement of Germans in Apatin began. Most of them made their way from the south of Germany to Hungary on the Danube (on the small ships called “Ulmer Schachteln”). The promised land, however, was often marshy and hard to cultivate. For a long time, the settlers struggled with the land and the outbreak of malaria, but finally were able to fructify the area. Apatin became a role model and centre of the German villages around it. The simple homes were replaced by stone buildings and a large church and a school were built. In 1768, the 600 German families living in Apatin were given market rights by Maria Theresa. Apatin was known for its ship mills. They were built in the form of a catamaran and many famers from the whole of Bačka came to Apatin to grind their wheat. Furthermore, silk mills, hemp cultivation and fishery could be found in the settlement. In 1756, the brewery Apatinska Pivara a.d. Apatin was founded. Up until today it is the largest employer of the town and is best known for its Jelen Pivo – “stag beer”. The various nations and religious denominations lived harmoniously together and the agricultural wealth led to higher living standards. Until World War II, around 250.000 Germans lived in the Bačka. The war ended the 250 years of peaceful cohabitation and the Germans of Apatin were displaced and had to flee. However, they have kept one tradition from their old home. Wherever they live nowadays, they try to celebrate the traditional parish fare in order to commemorate their roots. 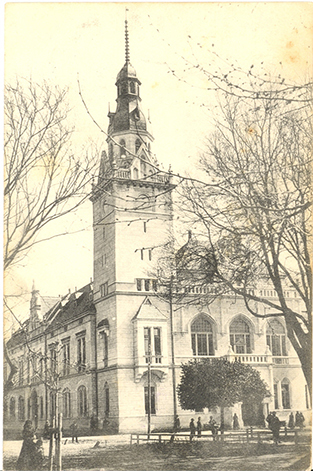 The Townhall of Apatin on a contemporary picture.